RESTON, Va., May 2, 2007 ��� Recreation vehicle owners are pumped up about the upcoming travel season and plan to use their RVs more this spring/summer than they did last year, according to a new study. Despite fluctuating fuel prices, the latest biannual Campfire Canvass survey of RV owners, conducted by the Recreation Vehicle Industry Association (RVIA), reveals that 76 percent of RV owners intend to use their RVs more this spring/summer than last year, and 20 percent plan to use theirs the same amount. Only 4 percent say they���ll use their RVs less. 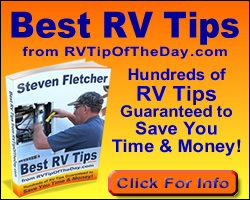 Nearly half (48 percent) say fuel costs will not affect their RV travel plans.�� Of those who said their plans would be affected, 60 percent will adjust to higher fuel prices by traveling to destinations closer to home.�� Fifty-six percent said they���d stay longer in one place. Many families are taking shorter, more frequent getaways in their RVs to accommodate their busy schedules. According to the survey, 91 percent of RV owners are planning three or more short RV trips (1-4 days) this spring and summer. America���s national parks are among the most popular destinations for RV trips this spring/summer, according to the survey. More than 100 national parks were mentioned, with Yellowstone, Yosemite and Zion the most popular destinations for RVers. RV owners appreciate the control that RVs offer in today���s travel climate. Unlike air travelers, RVers can bring anything they want onboard, including pets. According to the survey, 57 percent of RV owners bring pets along on trips.�� Most RVers traveling with pets are bringing dogs (88 percent), but some are also bringing cats (18 percent) and other pets such as parakeets, parrots, ferrets and even horses. RVing also strengthens family relationships, according to the survey. Eighty-four percent of the married respondents said RVing has brought them closer together, while 85 percent said RVing has contributed to a greater family bond. RVers enjoy an array of activities while traveling in their RVs.�� Favorites include: cooking out (76 percent), sightseeing (74 percent), and scenic drives (72 percent).�� Visiting friends and family was mentioned by 60 percent. ��Forty percent of RVers like to visit festivals and fairs.�� Other favorite activities include shopping, antiquing, and visiting theme parks or zoos. Almost half (45 percent) plan to use their RV to enjoy outdoor sports and activities with hiking (53 percent), fishing and hunting (52 percent), and biking (32 percent) mentioned as favorites. The Recreation Vehicle Industry Association (rvia.org) is the national association representing more than 500 manufacturers and component suppliers producing approximately 98 percent of all RVs made in the United States.